Wood Vs Fiberglass – Which Will You Choose? Wood entry doors make a serious statement about the house you live in. With a world quickly replacing all things wood with plastic it’s hard to imagine a world without beautiful wood entry doors. 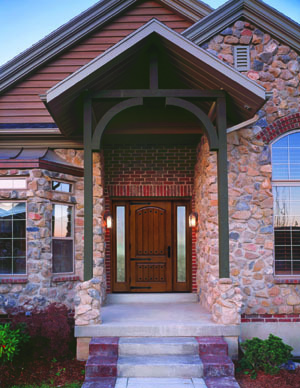 So given the choice between a wood entry door and one made of fiberglass which would you choose? Before you answer that you might want to read on to learn more about this interesting question. We’re in the process of beginning construction on a high end home that features exposed timber framing and lots of gorgeous natural building products. During the design process the topic of an entry door has come up on several occasions. More specifically the design calls for a real wood door similar to the one shown in the adjacent photo. My response to him was a simple question. In my opinion there’s zero reason to buy a real wood door today with the options that are available on fiberglass doors. 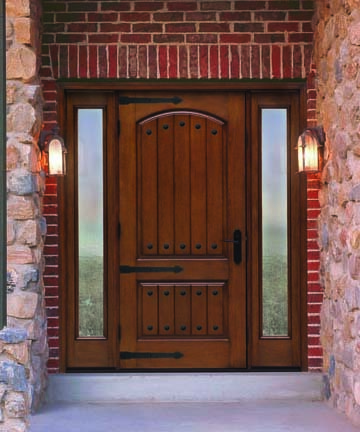 The photos on this page are from a Therma Tru Rustic Collection™ Fiberglass Door. I’ve used Therma Tru fiberglass doors many times and I’m telling you it’s very difficult to tell these doors from real wood doors even when you’re up close and touching them. According to Therma Tru fiberglass doors are 5 times more energy efficient than wood doors. Fiberglass doors offer many advantages including; they won’t warp, bow, twist, rot or decay. You can paint them or stain them and create an infinite number of custom finishes. And best of all they are typically cheaper than a high quality wood door of similar design. Which door will you choose? There’s no question in my book, I’m going to choose a fiberglass door every time over a real wood door. If you’re looking for a new entry door head out to a local door showroom and see all the great products. All major door manufacturers offer these type of doors and I’m sure you’ll find a style that fits your home.